About Boshco-Dustek – Boshco-Dustek, Inc.
Dustek has been manufacturing superior quality, reasonably priced dust collectors for more than 30 years. Dustek is a division of Boshco, Inc., the preeminent new and used woodworking machinery distributor in New England which recently celebrated its 75th business anniversary. We are located at 6K Dunham Road in Billerica, Massachusetts, approximately 30 minutes north of Boston. We manufacture and assemble our dust collectors right here in New England. Each unit is thoroughly checked and tested under power before it leaves our facility. Dustek Dust Collectors are in operation in every state in the U.S. and in the Caribbean, South and Central America, Canada, Asia, the Middle East and Africa. Dustek customers range from very large companies to medium and small professional shops. They also include High Schools and Colleges, the U.S. military, Federal and State Penetentiaries, Museums, and similar organizations. Applications include wood, plastics, solid surface materials, paper, cotton, fabric fibers, fertilizer and others. Our large customers mainly use our dust collectors for “spot” collection to supplement their large central systems. 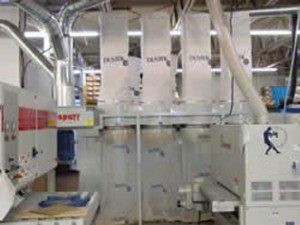 Smaller customers use Dustek to provide a complete dust collection solution for their shops. Regardless of their size, our customers have something in common they depend on Dustek’s performance and appreciate the quality of our product and the level of our service. See what our customers have to say about us. Dustek introduced a new line of Dustek Whispurr Ultra Quiet dust collectors at the 2001 Anaheim, CA Woodworking Show. The Whispurr received the 1st Prize Techy Award in the Solid Wood Category. Dustek customers were instrumental in helping us achieve this honor they patiently provided their facilities to use as our test sites. All Dustek parts and accessories are factory authorized and are available through your local dealer or the E-Toolshed Division of Boshco, Inc. Dustek parts and accessories are of superior quality and fit on any “lookalike” dust collector with 24″ diameter barrels.